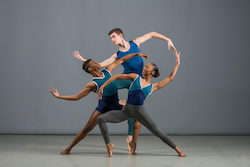 Students from The Ailey School Professional Division. Photo by Nir Arieli. Dancing costs money. Well, to get up and move is free, but to take classes, buy required clothing and shoes, order recital costumes, and more certainly isn’t. To have a dream to formally train in dance and not have the money to do so can be a heartbreaking experience. The dance world, and the world at large, could have also missed out on the offerings of a true visionary. 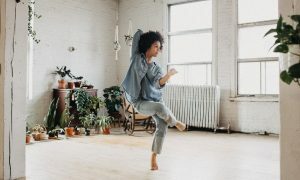 Additionally, given the gifts of dance training for individuals as well as larger communities, making dance more widely accessible to those of all socioeconomic classes can be a positive equalizing force out there in the world. Dance Informa speaks with representatives from three non-profit organizations working on widening access to formal dance training amongst all socioeconomic classes – Tina Banchero, artistic director of The Gabriella Foundation; Melanie Person, co-director of The Ailey School; and Juliana Abel, co-founder of Pair2Share. Photo courtesy of The Gabriella Foundation. Concerning The Ailey School’s renowned Scholarship Program, Person explains that “The Ailey School is a world-renowned educational institution dedicated to the highest level of training while also remaining the most diverse dance academy in the nation,” and how the school’s “financial aid program benefits all students at the school by making it possible for highly talented young dancers to pursue professional training to which they might not otherwise have access.” She elaborates that the dance training most often needed for building a professional career starts early, and is therefore quite expensive – from classes, to clothing and shoes, to travel and lodging in high-cost dance centers such as New York City. 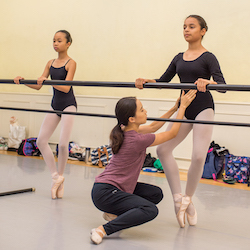 As such, The Ailey School has pledged to offer 450 students some form of scholarship aid – including tuition assistance and housing stipends – 75 percent of which are awarded to students of color, Person says. Students are recruited from all over the world and at NYC performing arts-focused high schools (such as the Professional Performing Arts School) through three auditions annually, with financial aid recipients chosen by the audition panel (including faculty members and The Ailey School’s Co-Directors Tracy Inman and Person). “Pair2Share started when I was packing up to move houses, realized how many dance shoes I had grown out of that looked untouched, and could not find any kind of organization to send them to,” Abel recalls. 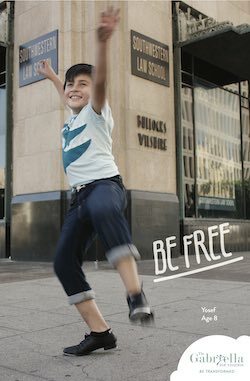 “As a dancer for 10 years, at the time, it seemed like a no-brainer to start a project to give back to a community that had already given me so much.” She explains that from there, she began researching non-profit dance organizations and saw an unmet need for an organization to help provide dance shoes for dancers in need. A symbolic meaning grew from there, under the slogan “Share your sole” – Abel and her Pair2Share Co-Founders, Meriah Grove and Mekayla Murphy, realized that there’s something truly special about sharing your journey in dance, through your shoes, with other dancers. Pair2Share Co-Founders Juliana Abela and Meriah Grove. 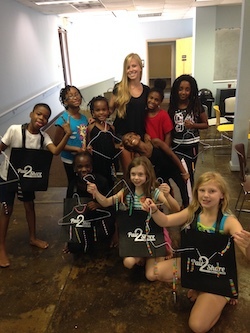 “Dance is an art form that brings people together, so it seems right to share our ‘instruments’ when we can and when others may need them to continue doing what they love,” Abel affirms, adding that, at first, Pair2Share began with “the intention to donate new and gently used dance shoes to dance organizations or programs that serve students of lower socioeconomic status.” Later on, however, the organization changed policies to offer collected shoes to anyone requesting them. “The idea of this is a pay-it-forward kind of deal. We will serve anyone who needs a pair of shoes with the hopes that they will continue the circle and later give a pair back,” Abel explains. The Gabriella Foundation. Photo by Charles-Ryan Barber. Dance Camp at Moving in the Spirit. Photo courtesy of Pair2Share. 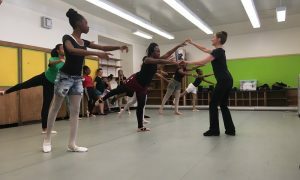 Person says she is “proud that graduates of The Ailey School are versatile and diverse in so many ways, with successes and accomplishments from Alvin Ailey American Dance Theater to concert dance to Broadway, from medicine to law to politics. They’ve made a strong impact in the world of dance and beyond.” Another significant accomplishment of the scholarship program is that a notable percentage of members of the professional company were once scholarship recipients. Moving forward, program administrators hope to refine the recruitment model for discovering nationwide talent. Banchero is incredibly pleased that everybody dance! has “grown from 35 served to 4,577 served a year,” and that second- and third-generation students are in those ranks. “Our goal is to keep expanding and to have lasting impact in the communities we serve,” such as through securing funding and initiating class schedules at a few sites where relationships are already in place, she shares. Such goals reached or not reached, the accomplishments, values and visions behind these organizations’ broadening of access to dance to those from all socioeconomic classes can only brighten individual lives, larger communities and dance as an art form.